Goodness, summer has come in with something of a bang! Coming from Texas I am used to the heat, and I sort of perversely look forward to summer baking. Yes, the oven makes the house hot but if you plan it just right you can get a cake baked before the heat of the day and have it cooled and ready for dinner. This is just such a cake. It is great because you serve it chilled because of the scrumptious pudding filling/topping. This is my take on the old fashioned poke cake. 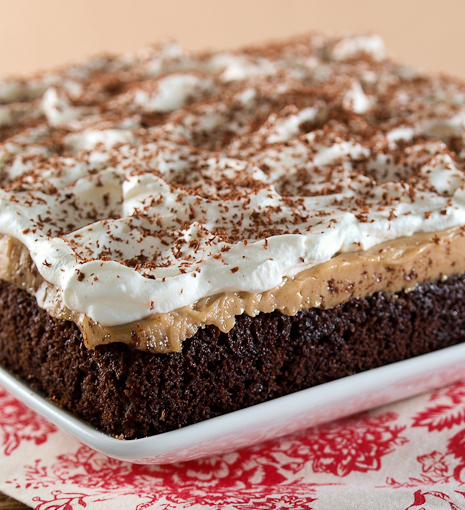 Most recipes for poke cake call for boxed cake mix, boxed pudding mix, and frozen whipped topping. 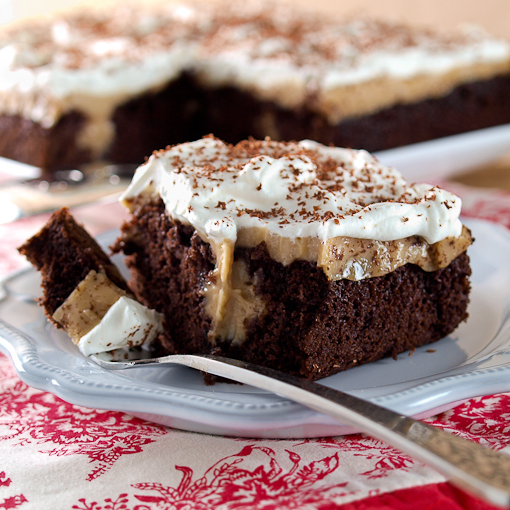 My recipe uses homemade chocolate cake, homemade peanut butter bourbon pudding, and freshly whipped cream. Yeah, this is my ultimate summer treat! I love the rustic nature of this cake. It is very random, with little pockets of creamy pudding scattered throughout each slice. It is very comforting, and it is lovely on a warm summer day because you serve it pretty cold. 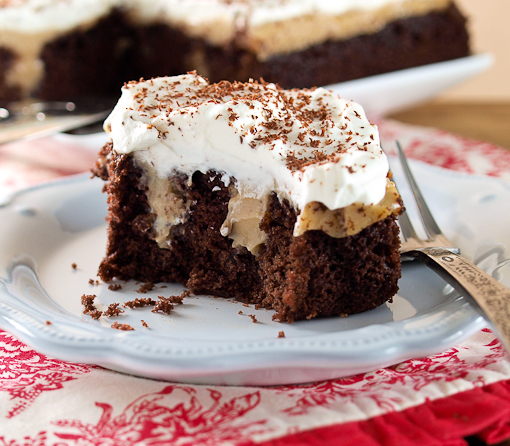 There are two specific tips I can offer that will help you make the best possible poke cake. First, do not over-bake the cake. That means at the 25 minute mark you need to check it. It goes from moist and perfect to dry and over-baked in a matter of minutes, so please check early and check often! Second, try to time it so the pudding is done about 5 minutes after the cake comes out of the oven. If you start the pudding at about 12 minutes before the cake is done you will be about right. It is something of a balancing act I know, but the cake is better if you can pour the piping hot pudding onto hot, fresh cake. They seem to meld together better, and each benefits from the flavor of the other. The pudding calls for a tablespoon of bourbon, but you could use rum, whiskey, scotch, or leave it out if you prefer. I like the subtle smoke it adds, as well as that little bite it gives the pudding. This is a lovely end to a meal of smoked meats, BBQ, or any dish served pool side! 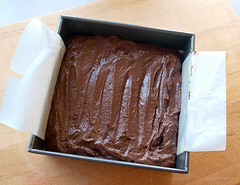 Heat the oven to 350 F and spray an 8×8-inch cake pan with non-stick cooking spray. Line the pan with parchment paper, making sure there is a two inch overhang on either side of the pan, and spray the parchment with non-stick cooking spray. In a large bowl cream together the butter and sugar until well combined and somewhat lighter in color. 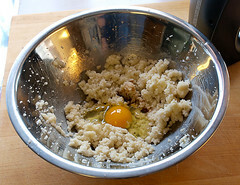 Add the egg and vanilla and mix until uniformly mixed. 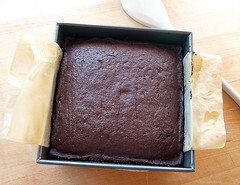 In a medium bowl sift together the flour, cocoa powder, baking powder, and baking soda. 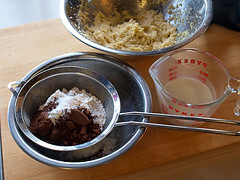 Alternately add the flour mixture and milk into the butter in three additions, beginning and ending with the flour. Pour the mixture into the prepared pan and spread so the patter is even. Bake for 25 to 30 minutes, or until the cake springs back when gently pressed in the center, and the edges of the cake pull away from the sides of the pan. Do not over-bake. During the last 12 minutes of baking prepare the pudding. In a blender combine the milk, brown sugar, peanut butter, cornstarch, and egg yolk. Blend until smooth, about 30 seconds, then transfer the mixture into a saucepan. Cook over medium heat, whisking constantly, until the mixture comes to a boil. Cook for 1 minute then remove from the heat. Add the butter, bourbon, and vanilla. Once the cake comes out of the oven immediately poke holes into the cake with the end of a large wooden spoon. 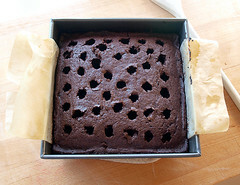 Pour the hot pudding over the cake, tapping the cake gently on the counter to release any air bubbles and make sure the pudding is in the holes. 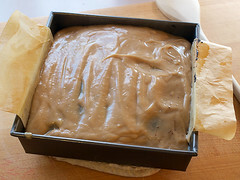 Cover the cake with plastic and cool on the counter for 1 hour, then chill for at least 4 hours or overnight. Just before serving prepare the topping. In a stand mixer, or a large bowl with a hand mixer, combine the cream, powdered sugar, and vanilla. 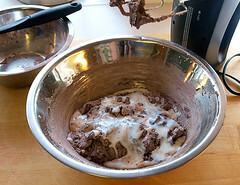 Whip until the mixture forms soft peaks, about 2 minutes. 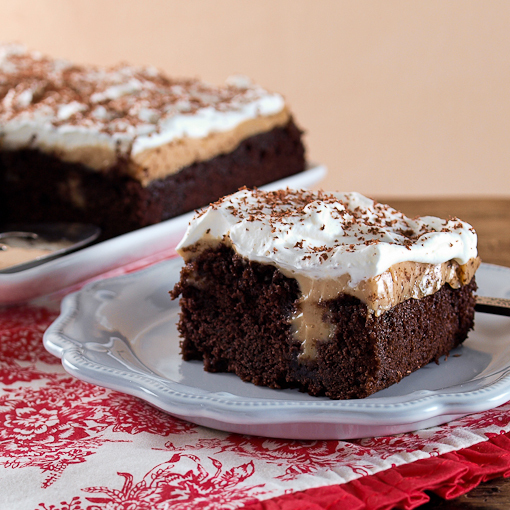 Spread the whipped cream over the cake and garnish with grated chocolate.